The world on screen is one that viewers expect to be well mannered; celebs are expected to keep up appearances by projecting social propriety and being a well-spoken cordial figure. But, the world on screen is not one we are used to, we keep up appearances in the professional and academic spheres but on a boozy Friday night at the pub, no one’s thinking about social etiquette as the quintessential Brit’s potty mouths are unleashed. The sporting world may be strict when it comes to swearing, but it is not a profanity-free zone either. Wimbledon 2015 was in full swing when Serena Williams comes onto the grassy court, she is an intrepid warrior ready to battle and conquer. Her unrelenting focus to keep her eye on the ball is short-lived though as she slips during the first-round match and utters an ‘audible obscenity.’ The slip-up, literally, earned her a code violation. The world of video gaming, another on-screen indulgence, is not guilt-free either. Who is the naughty company? None other than the supposedly child-friendly Nintendo. In Nintendo’s Rio 2016 Olympic Games, Shadow the Hedgehog has been blamed for dropping the foul-mouthed four-letter c**t bomb in a game rated to be for children aged 10+. When hearing the clip it is unclear what the character says exactly, but the outrage did leave a few disgruntled parents. 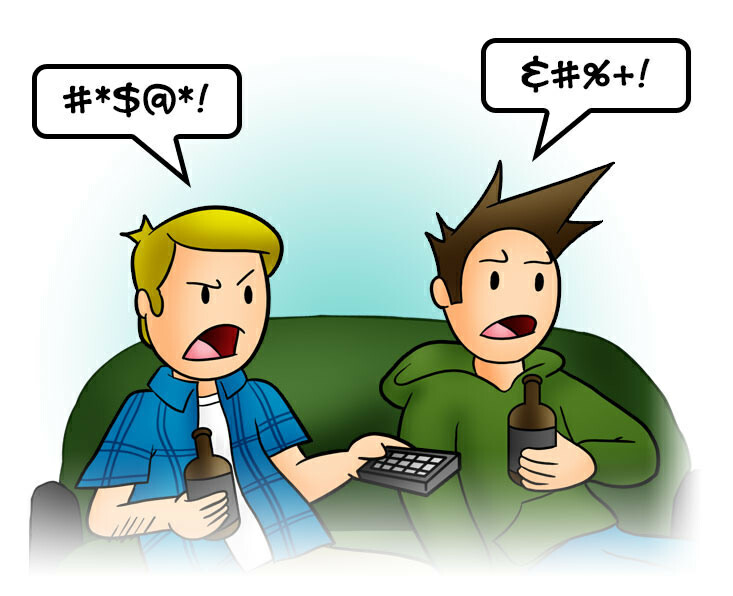 The use of profanity is common in most cultures and is a way of verbally releasing pent up frustration or excitement. We have got classics in every language such as the British favourite f**k off, French merde (sh*t) or Polish kurva (b*tch). The two different types of swearing show that although swearing may appear to have no lexical content and is not an essential feature of spoken language the way we use the linguistic feature adds unexpected value to profanity. On the one hand, people may swear because they are excited or happy; something titillating has occurred that has shaken you up internally and you suddenly have a need to express the desire. This has been labelled as ‘social swearing’ and is intended to be a friendly way of fitting in with people. Tajfel (1979) contributed to social identity theory which states that the groups that people belong to are an important source of self-esteem, so swearing can be a way of psychologically seeking to be part of an in-group. On the other hand, when something goes wrong an internal bubbling of a different kind emerges, one more angry and frustrated, this is when ‘annoyance swearing’ comes into play. This occurs when someone is mildly stressed and is rarer than social swearing. Swearing in an unpleasant situation may not be just a random outburst but a way to deal with pain more effectively. A paper published in NeuroReport by Dr. Richard Stephens and Claudia Umland of Keele University, states that people can submerge their hand in ice-cold water for longer periods of time if they swear during the experience. When we swear, it is believed, that a people alert their amygdala which triggers the fight-or-flight response and prepares the body to tackle a danger, expecting pain, or to flee. The trigger then causes a surge of adrenaline which increases heart rate and, in combination, this increases pain tolerance. Therefore, cursing is not just a naughty way to change the course of conversation. In London, cursing is something synonymous with slang and the pairing of the two creates a perfect linguistic symbiosis. It is difficult to walk the streets of this fine city without hearing some form of dialect accompanied by a profanity. If you are a resident you cannot walk the streets without hearing, ‘That was f**king bare jokes, blud!,’ or some similar phrase full of spirited intent. Us Londoners proudly optimise the use of swearing and effortlessly integrate the practice into our daily lives.